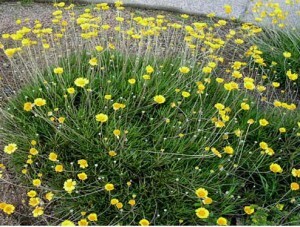 The Angelita Daisy is a medium growing clumping evergreen. It loves full sun and is drought resistant. It blooms spring to fall and sometimes all through our mild winters. Angelita daisy will spread to 18″ wide and 12″ high. It is also frost resistant. 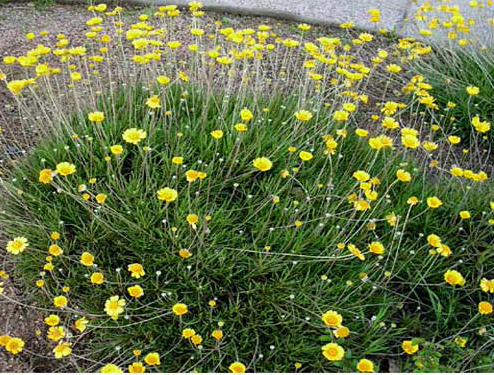 The Angelita Daisy has a clump of dark green grass like leaves at the base and lots of little yellow flowers that raise about 8 inches higher than the leaves. They are great as little accent plants Arizona desert gardens. You will see this plant all over commercial properties due to their resiliency and tolerance to our Arizona heat and cold heartiness.